So, here is another delicious tea-time treat. Actually, they’re an anytime treat because they’re WAY too good to restrict them just to tea-time! They are absolutely delicious. Fudgy and gooey on the inside with a chewy edge, they are just so good. Once you have tasted these brownies, you won’t be able to stop at just one, you simply have to have another. Totally addictive. They’re simple to make, which in my book is a total bonus because lets face it, who has the time for long complicated recipes. 1. Preheat the oven to 170C, 325F or Gas mark 3. Line the a brownie pan with greaseproof paper. 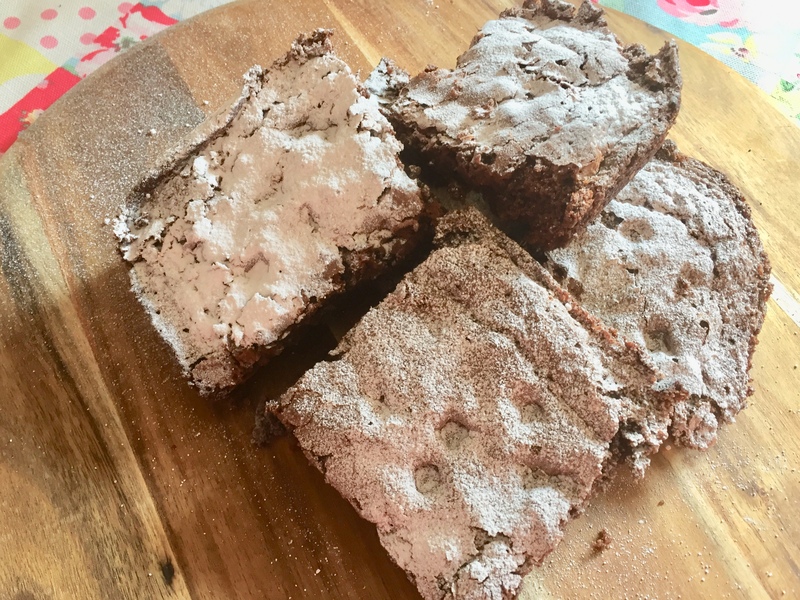 Greasing the pan just with butter will not be enough when you’re baking anything with a chewy centre, so it is important to line the brownie pan with greaseproof paper. Trust me, if you don’t line the pan, they will stick. Even to the non-stickiest of non-stick pans! 2. 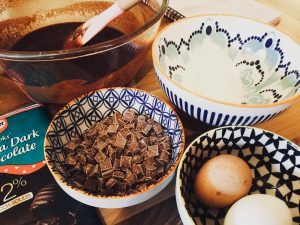 Put the dark chocolate chunks and the butter in to the same bowl. Melt this over low heat and stir with a wooden spoon until melted. 3. Once the chocolate and butter have completely melted, put this bowl aside to let it cool down completely. Then add the sugar and stir well. 4. Add the beaten eggs and vanilla extract into the bowl and stir until smooth. 5. Next, add the chocolate chips, flour and salt into the bowl and lightly fold in the mixture. Don’t beat the mixture too heavily, keep it light and airy as you can. You don’t want to over-beat this part. 6. Pour the mixture in the lined cake tin and tap the sides a couple of times to get rid of air bubbles. 7. Place the tin in the middle of the oven at 170C and bake for 45 minutes. 8. After 45 minutes, check to see if it’s cooked by sticking a knife in the middle of the brownies. If it’s baked, the knife should come out clean. 9. Let it cool in the tin for 15 minutes and then remove it on to a cooling rack. Leave it to cool down completely before cutting in to it. Cut to size as desired. I dusted mine with icing sugar because I like the look of it but that’s just personal taste. A quick note. The recipe says 30g of flour. When I first read this, I wasn’t sure this was the right amount, it didn’t look like enough and I thought the recipe was wrong but it isn’t.